This package can generate HTML pages programatically with Bootstrap. 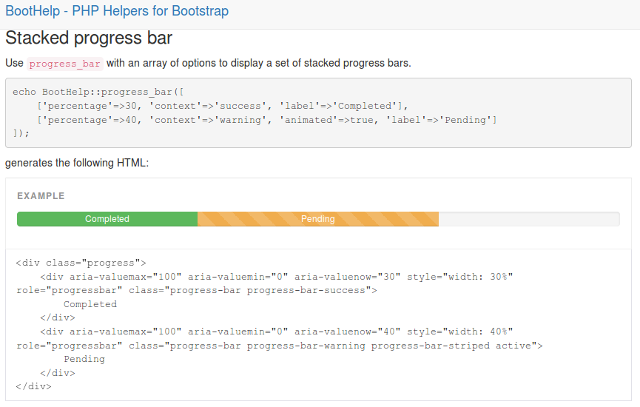 It provides a set of helper classes that generate HTML for several types of page controls using Bootstrap. Currently it provides helper classes for alerts, buttons, button groups, toolbars, dropdowns, icons, modal dialogs, navs, navbars, panels, progress bars, badges, labels, images and thumbnails. 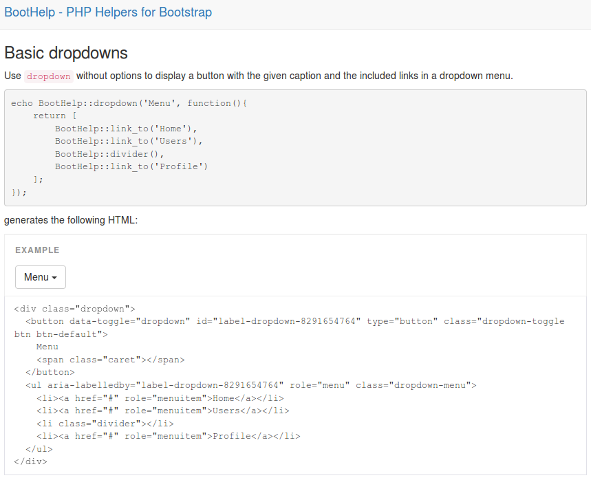 A simple set of classes to generate most of the Bootstrap's components without writing any HTML code, just PHP. However, to get all of its powerful resources, usually you have to write a lot of HTML code, no matters if you want to use a simple component, like [Modal] for instance. 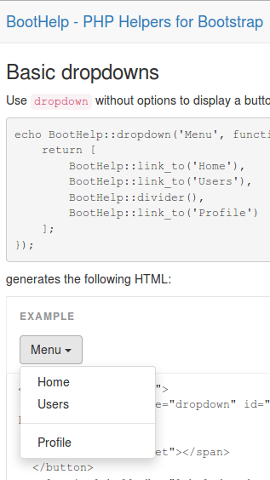 BootHelp (Bootstrap Helpers) is a set of classes that allows you to get all the power of Bootstrap's components with no need to write any HTML code (or at least a minimun amount of it). [PHPUnit] to execute the test suite (optional). 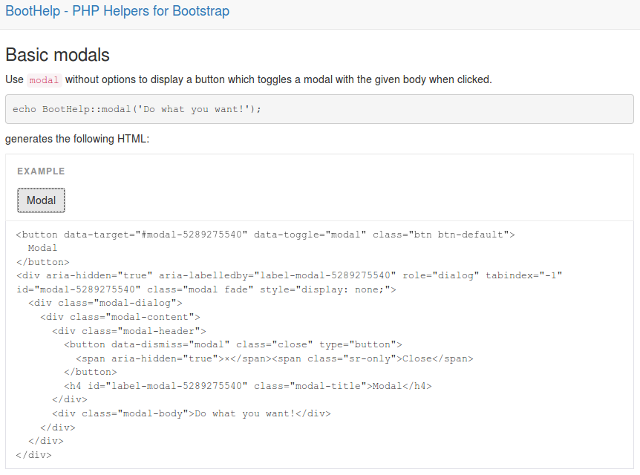 Remember that BootHelp just generates HTML code acording Bootstrap specifications v3.3.4. 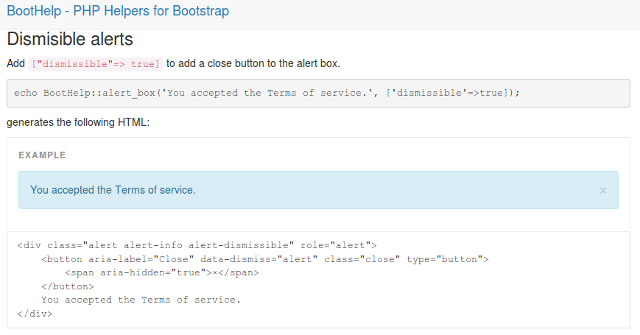 To get running the code as you expected, you have to install all [Bootstrap requirements]. [Composer] is the PHP's package manager and is the recommended way to get packages for your projects. It's also able to build automatically *autoloaders* if you wrote down your code using PSR-0 and/or PSR-4 standards, avoiding you headaches about everything related to loading classes. Copy and paste BootHelp folder in your project root. You have 2 ways to use BootHelp: Using BootHelp abstract class and then call any of its methods. The other way is to get an instance of the component you want to use. ContentTag, Divider, Horizontal, LinkTo, Vertical, AlertBox, Button, ButtonGroup, ButtonToolbar, Dropdown, Icon, Modal, Nav, Navbar, Panel, PanelRow, ProgressBar. To get an idea about how to use BootHelp classes, what parameters you have to provide, what classes you can use together, and somethings like that, there is a complete guide included, that you can load in your browser. The guide is located in Guide folder. Actually, when you download BootHelp you can open the file index.php in your browser to read all the information about the classes. Get into BootHelp root folder. Copy the file bootstrap.min.css into Guide/css folder. Copy the files bootstrap/fonts/intoGuide/fonts* folder. Copy the files bootstrap.min.js and jquery.min.js into Guide/js folder. Find a way to integrate BootHelp with template engines like [Twig]. Feel free to contribute!!!. Welcome aboard!!! Added support for badges, labels, images and thumbnails components. Refactoring of few Base methods. Fix minor bug in progress bar label. Adding full customizing options for modal button. Adding support for generating Button Groups and Button Toolbars. New tests for new compoments. Updated test for Dropdown, Nav and Navbar components. Better integration between Dropdown and Nav / Navbar. Adding correct class when a Button is within a Navbar. Commendable deed, thank you for it.